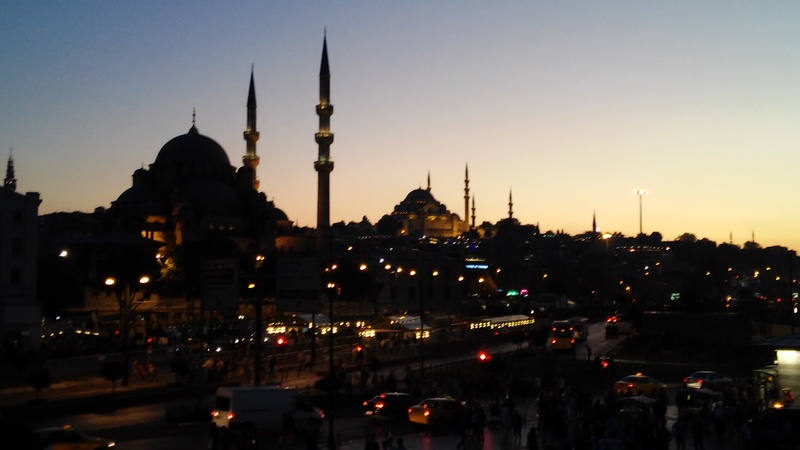 My time in Istanbul was drawing to a close and I was feeling sad. I’d been wandering through the streets of the old town trying to find a Syrian family I’d seen begging earlier. 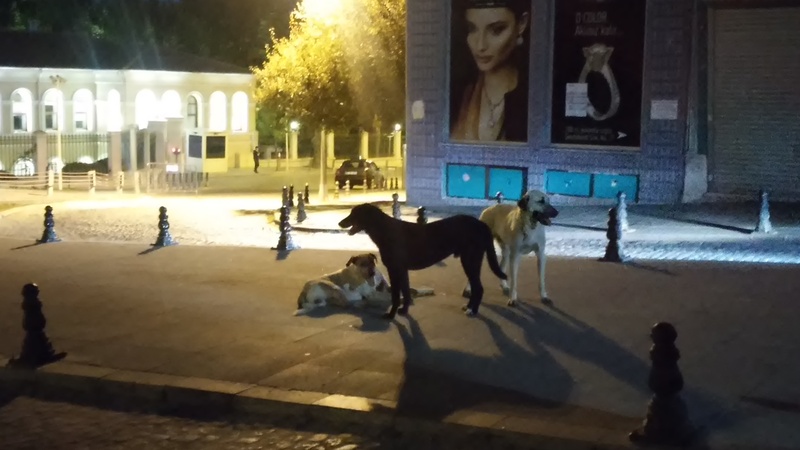 I’d walked right past them – then, riddled with guilt – asked LSB to help me find the way back so I could give them some Turkish Lira. When we got there, they’d gone. 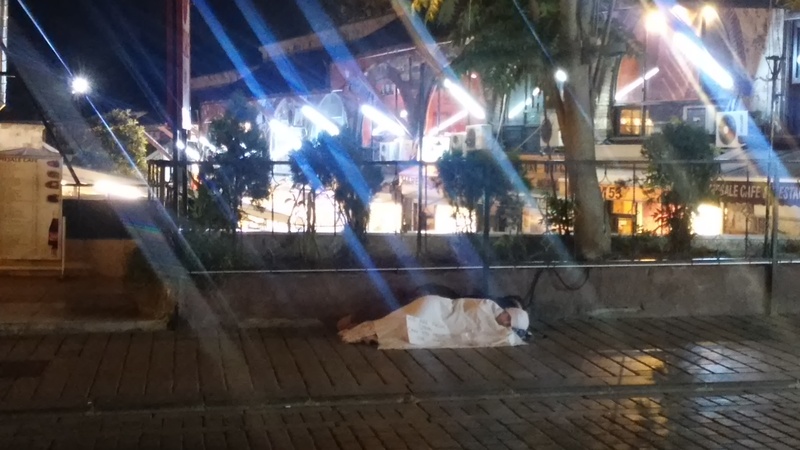 Two Syrian refugees sleeping in Istanbul’s old town. We bought some tea and brought it to a bench. From there we had a view of both the Hagia Sophia and the Blue Mosque, which seemed to be competing for magnificence. Above us, a sea gull was being tormented by a man selling laser pointers. The light followed the swooping bird relentlessly, bathing its feathers in a red glow, until the vendor got bored and turned it off. “I think I have hüzün,” I said, referring to Orhan Pamuk’s description of a particular form of Turkish melancholy, which he ascribes to the decline of the Ottoman Empire. It is not rational to feel the combined weight of the world’s woes on your shoulders. As benign as the trigger for your despair might be, this kind of melancholy does not redeem itself by serving as a call to action. Instead, as I sat there, watching men shuffle around trying to sell packets of tissues and stray dogs sleeping under the street lamps, the feeling that coursed through me could best be described as inertia. LSB and I agree that I probably experience melancholy more often and more acutely than most. The experience encompasses both the general and the particular. While I may begin by grieving the decline of a particular friendship in my life, I am likely to end up lamenting the inevitable death of all relationships. My melancholy is not discerning. Sometimes I cry at a song that sounds sad but whose lyrics I am unable to decipher. LSB and I share a deep admiration for a friend of mine who I believe distinguishes herself by her ability to – if this is the technical term – “just get on with it.” Her interests are practical – she loves her car, her exercise regime and ticking things off lists. She is not somebody to talk to about ideas or sensations. Her conversations cover familiar ground – they are uncomplicated and comforting – focussing more on mechanical processes, like car washes and the practical details of her work, than on overarching themes – like interrogating the status quo. I enjoy her company; our conversations remind me that by focussing on life’s more trivial obstacles, we can regain some control. Even if that simply means knowing the best place to fill up a tank. “Would you like to be like that?” LSB asked me, his eyes now following a drone which was circling the Blue Mosque. “Sometimes I really would,” I said. “But would you really?” he asked, knowing he might provoke me into contradicting myself. “Life would lose its richness,” said LSB. “I guess it would,” I said smiling, reluctantly. 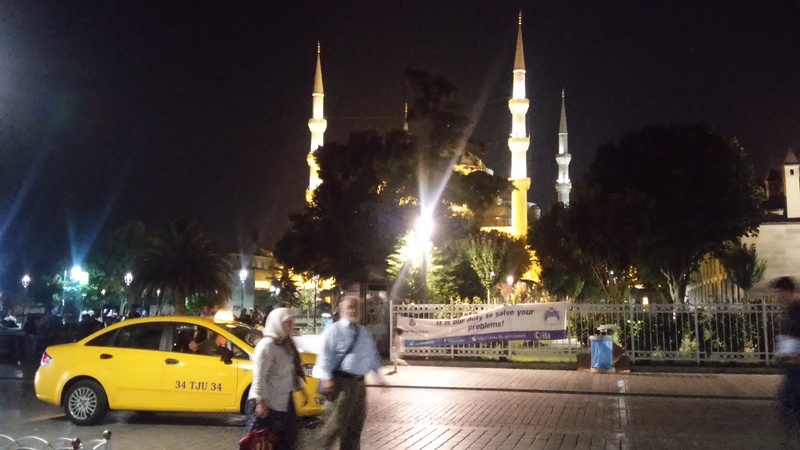 Last week I had the pleasure of being an outsider in Istanbul. The beauty I encountered there was unlike any I’ve experienced before. 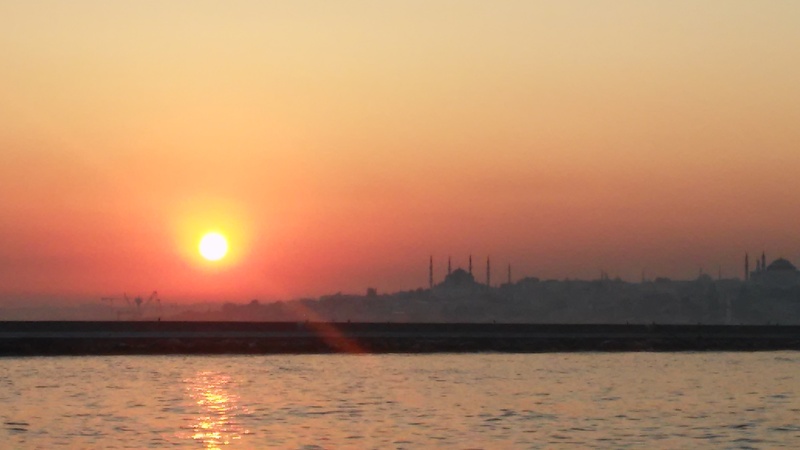 There is the obvious beauty of the city’s magnificent skyline – particularly at sunset, when the silhouettes of mosques and ancient towers merge with the starker contours of the skyscrapers and cranes– and everything , including the glittering Bosphorus, is bathed in an orange glow. But there is a different kind of beauty too – a fragile kind, which makes you feel that the entire city is held together by the most delicate of threads and that, if you were to tread too hard or in the wrong place, the entire metropolis could crumble before you. This fragility is everywhere. It is in the wooden houses, with their crooked windows and shabby fronts and the chipped paint on the doors. It is in the young waiters outside restaurants, who – having failed to lure you in with a flashy smile and cheeky soundbite, return with resignation to the car-racing games on their mobile phones. It was in the way our taxi driver whizzed through the city without a seat belt – getting lost in the old town and shouting at other drivers for directions yet saying nothing to us. It was in the way young boys wove through the heavy traffic selling bottles of water in the searing heat. It is in the chaos at the Grand Bazaar, where the individual spiels of hundreds of vendors selling you the same wares are at once farcical and endearing. It is in the way they make you feel special though you know you are not. At the waterfront, the cries of men selling Hugo Boss perfume, corn-on-the-cobs, selfie-sticks and even, apparently, Viagra, compete with the blare of the ships’ horns on the Bosphorus. It is a clamour suggestive of both hope and despair. Pamuk ascribes Istanbul’s peculiar melancholy to the decline of the Ottoman Empire – to a collective mourning for what was and never again will be. If the source of Istanbul’s beautiful fragility lies in its history – it is nevertheless in the scramble of every-day life on the streets where it is best preserved. Fragility can take many forms. Before I went to Istanbul, I consulted the websites of several countries’ embassies to read their advice for travellers. In the days before my trip, there had been violence in the south of the country and gunfire outside a palace in Istanbul. There was also, apparently, a specific terror threat to the city’s public transport network. As so often happens, my fears dissipated as soon as I set foot in the city and became distracted by its magnificence. 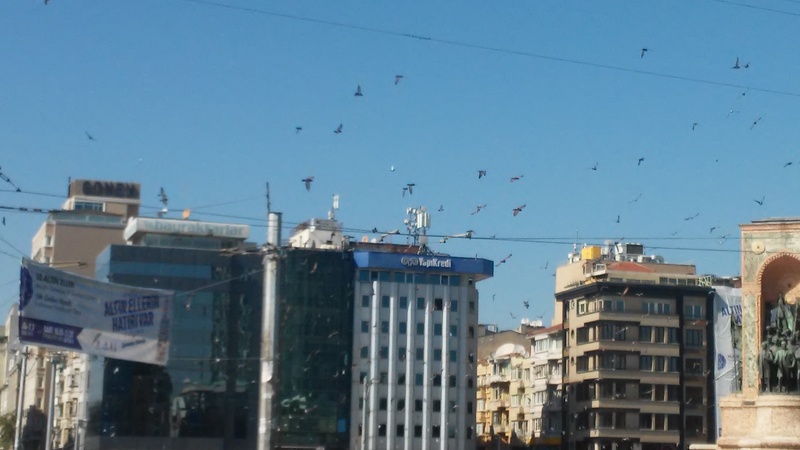 But as I approached Taksim Square for the first time, my unease returned. The area had been cordoned off and was encircled by police vans. 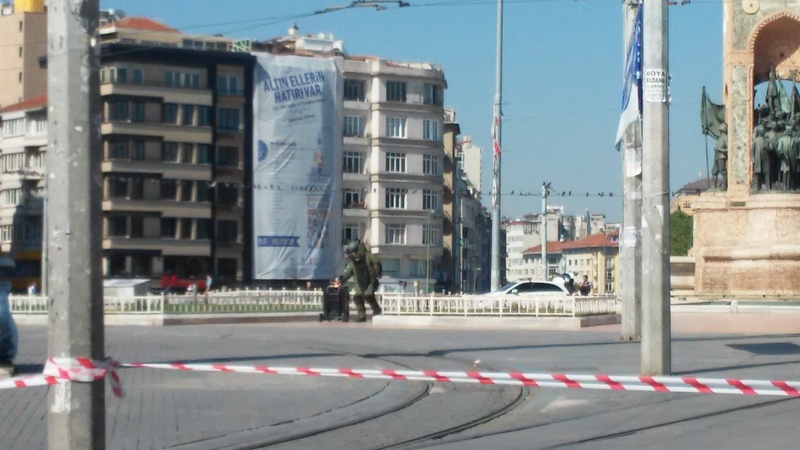 Crowds had gathered to watch a man in a bomb suit make his way towards the towering statue of Attaturk, the founder of modern Turkey. The man carried out a controlled explosion – terrifying a flock of pigeons into flight. Its power sent a shiver coursing down my spine. and the square was once again teeming with people. It was if nothing had happened.